What can printed wire bound books do for me? Wire binding sometimes known as wiro binding or wire-o-binding is one of the most popular commercial binding methods and is known by a number of different names. A wire bound book is the perfect choice for annual reports, presentation documents and cookery books. It is also ideal for manuals that need to lie flat on a desk. This is the ideal solution to binding loose leafs, it is robust and versatile. With the wire binding method, punched pages are inserted onto a "C" shaped spine and then a wire closer to squeeze the spine until it is round. Documents that are bound with wire binding will open completely flat on a desk and allow for 360 degree rotation of bound pages. Azimuth Print, the UK's premier wire bound book printer offers a low-cost, quality wire bound book printing service. 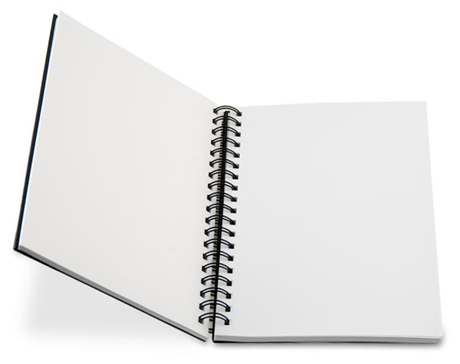 We can provide wire bound books in three sizes, A6, A5, and A4 in portrait and landscape. Other bespoke sizes can also be produced. Our products feature full-colour covers printed on high-quality 300gsm Gloss board, while the inner pages are produced using 100gsm Multicopy paper. You can choose the cover to be laminated for greater protection if you wish. Our wire bound books contain between 64 and 500 pages in quantities ranging from one to 500, making them ideal for anyone wanting a one-off copy to a mass-produced run. You can either send us your own artwork or commission our designers to come up with a great look for your printed books for an extra charge. If you need to make small changes to your copy and design, we can take care of these at no extra cost, while larger amendments to your wire bound book can also be made for a fee. To find out more about the UK's premier wire bound book printer, just get in touch for a quote or for answers to any questions you might have about our wire bound book printing services.